Wise Sons Friday surprise: new deli in Mission is now open – J.
It’s been a long time coming. At the corner of 24th and Shotwell streets in San Francisco’s vibrant Mission District, in a location flanked by taquerias, hot pastrami on rye is now being served. After more than a year of functioning as a pop-up eatery in other restaurants’ spaces around town, Wise Sons Jewish Delicatessen is now open in its permanent home. Although owners Evan Bloom and Leo Beckerman told j. earlier in the week that the restaurant wouldn’t open until the last week of February, the doors unexpectedly swung open to the public on Friday morning at 9 a.m. The address is 3150 24th St., and the phone number is (415) 787-3354. The restaurant “will stay ‘softly open’ through the long weekend,” the food blog sf.eater.com reported. The blog noted that the hours will be 9 a.m. to 2 p.m. on President’s Day. Click here to get a look at the opening menu. “It’s a little nerve-wracking,” Beckerman said as the opening day approached. “But we’re more excited than anything else.”The food blog Inside Scoop reported that this weekend is “technically” a soft opening, and that an official grand opening won’t be held until Wednesday, Feb. 22. It reported the following opening hours: 9 a.m. to 6 p.m. Wednesday-Saturday; 9 a.m. to 3 p.m. Sunday. Going forward, the deli will be closed on Mondays and Tuesdays, and Wise Son’s popular Tuesday pop-up at San Francisco’s Ferry Building will continue to dish out deli favorites such as corned beef, reuben sandwiches and chocolate egg creams to go. 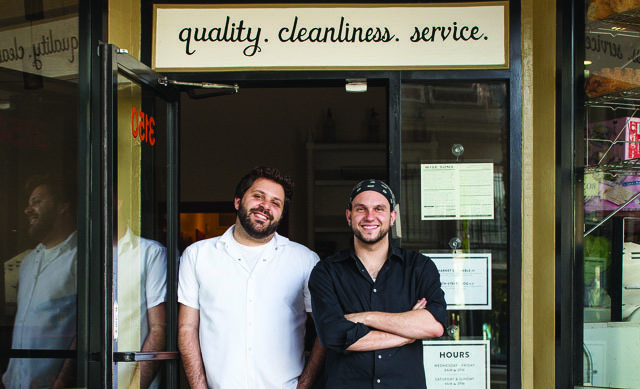 Bloom and Beckerman, after gaining experience working food festivals and at friends’ food carts, began operating their own pop-up in January 2011. The endeavor’s success prompted them to start searching for a permanent home, which they finally found at 24th and Shotwell – in a space previously occupied by the preparation area of taqueria El Tonayense. At a “soft” opening brunch on Feb. 11, Bloom and Beckerman served up bagels and bialys from Oakland’s Beauty’s Bagels, smoked trout lox, corned beef and vegetable hash, and sides like potato salad, coleslaw and home-brined pickles. The event sold out within 24 hours of being announced. As for the new space, the ever-changing 24th Street neighborhood has been extremely welcoming so far, said Beckerman.